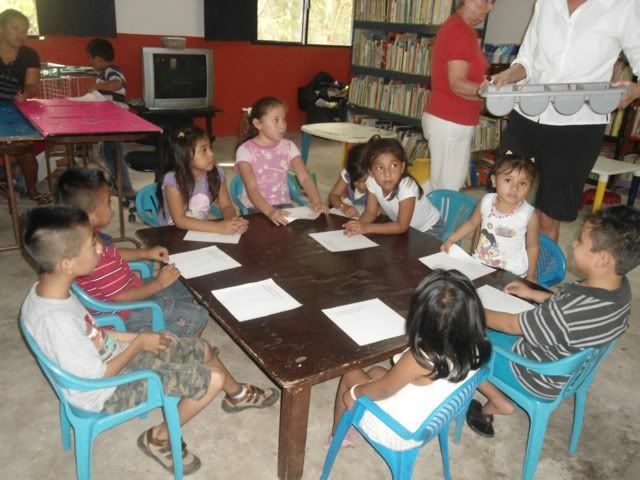 One of our favorite local not for profits, Hekab Be Library in Akumal, has published an updated Wish-list for Spring and we would like to help by sharing this with our "Life's a Beach" readers. We so often receive inquiries from customers and friends traveling to the Riviera Maya wondering what they can bring for the local school children in the region and how it will reach the intended recipients. The staff and volunteers at Hekab Be Library have been working with local children in this area for over 13 years and we were pleased to include them for 2 years running as a featured charity in our "12 Days/12 Ways" Holiday Giving Series which debuted in 2010. -water based paints and fingerpaints: we are almost always low on these. Liter size bottles are best, but we'll take whatever you can fit in your suitcase! New games and puzzles, especially well loved by the kids are the extra large piece floor puzzles, we could use a few more! Also, smaller puzzles for young kids (30 pieces or less) and 100 piece puzzles. Games we'd love to have: Chess, Checkers, Chinese Checkers, Connect 4, Mastermind, Memory, Mousetrap, Candyland, Hi-ho Cherry-o, Chutes & Ladders, other games that are either in Spanish or don't require words. Games we already have: Scrabble, Monopoly, Pictionary, Guess Who. ***Please remember: NO broken toys, NO big toys (no room in crowded homes), NO toys or games that require knowledge of English, and NO toys that need batteries (no money to replace them). As always, we welcome donations of gently used clothing, scroll down for a list of suggested items. We sell these clothes at minimal cost to local families to raise funds for library operations. Our most popular item is clothing for kids. Small or medium adult sizes also sell well. Anything XL or larger is simply too big for the locals who come to the bazaars. Other items that sell well are anything for infants or youth sizes, or small adult sizes, Spring/Summer weight clothing, such as: shorts, t-shirts, skorts, bathing suits, camis, tank tops, flip-flops, sneakers, baseball caps, sun hats, umbrellas, any trendy clothes - Old Navy, Children's Place, Circo, Gap... Light SHORT skirts - long ones are too long for locals. Please don't feel the need to go out and buy new clothes, pick stuff up at your local thrift store if you must, or canvas your neighbors for their used clothes-- help recycle clothing and help Hekab Be!